Wow! It’s hard to believe how fast the summer went. Among moving, readjusting, and starting a new semester, this month’s Secret Recipe Club was a lovely break from life. Amy, at A Little Nosh, is an active woman managing a family and household. I’m happy to say she seems choose plenty of “real food” ingredients, and to like chocolate, especially with peanut butter (yum). Check out some of her dessert recipes if you have a few minutes. My pick for this month was, sadly, not the triple awesome doughnuts but instead a seriously kid-friendly main dish imbued with the nostalgia of childhood. My grandmother often bakes cornbread on top of meat chili, and it reminds me of many happy summer vacations with them. While the multi-step recipe might seem like a lot of work, if you double the chili recipe, you have at least two meals. One for the table, and one for the freezer. The chili reheats very well, and you can always serve it with crackers or rice. FYI, you can use a cornbread mix of your choice as a shortcut or use your classic from-scratch recipe. Typically, a homemade cornbread will be lower in sugar and possibly salt, and, if you follow the recipe below, can be part or all whole grain. A fluffier cornbread is pobably a better choice, as the bottom can be a little bogged down from the chili. Heat the oil in a medium saucepan. Add the onion and stir for a few minutes. Add the garlic, spices, and sweet potatoes. Continue to cook, over medium heat, until the sweet potato is cooked. Covering it speeds the cooking time, but remember to stir occasionally. Add the beans and salsa, then heat through. Preheat oven to 350. Grease a large casserole dish or two smaller ones. (Custard cups are fun for individual servings.) 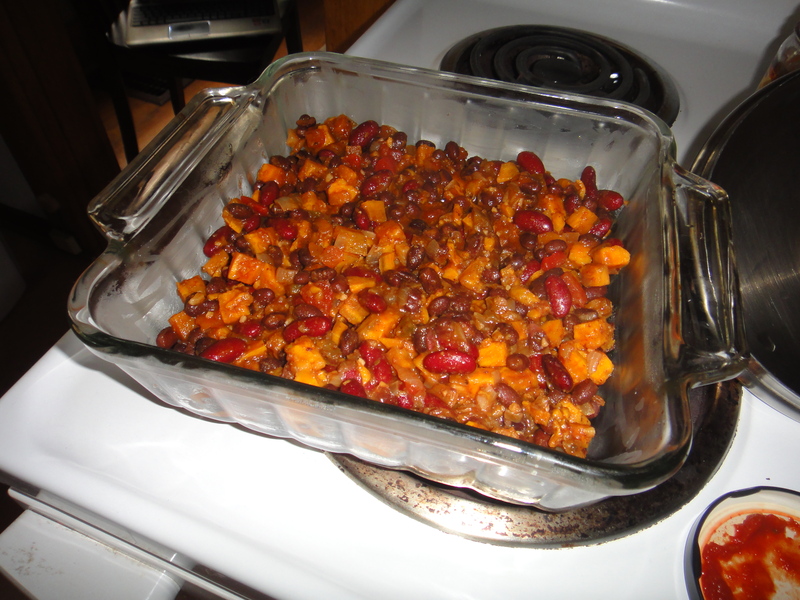 Pour the “chili” into the baking pans, as shown. Top with the cheese. Mix the dry cornbread ingredients thoroughly. Add the milk and egg, stirring lightly just until well mixed. Stir in the oil or melted butter. Pour over the chili and bake for about 25-30 minutes. Next Next post: Elect Michelle! What a great dish for fall. I’m sure it’s good with chicken, but your vegetarian version sounds amazing as well. Great choice. I love cornbread, and was intrigued by the addition of “stuff”. I can hardly wait for the temp to slip out of the 90’s! Yum! I love this vegetarian version. 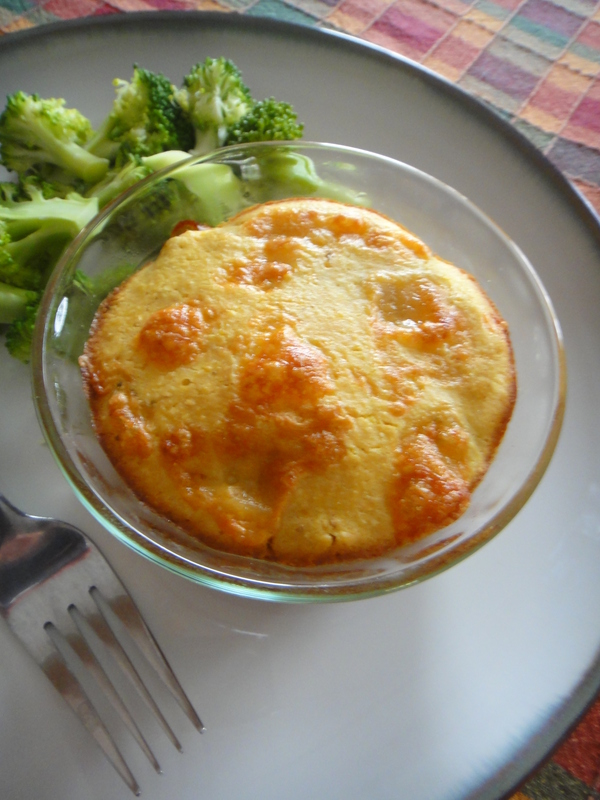 I’ve been all about comfort foods lately (fall is my favorite food season/season, in general!). This is definitely going to be made soon! What a great meal this would make!! Love your changes.